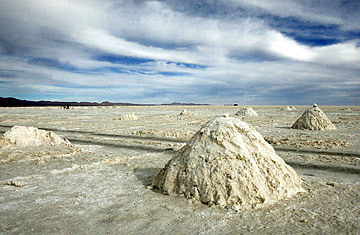 A Uyuni salt-land has an extension of 12,000 square kilometers of salt and at the same time is the biggest reserve of Lithium. President Evo Morales, Bolivia's first indigenous head of state, prides himself on state control over natural resources he nationalized the country's (massive natural gas reserves in 2006). If the past is any indication, electric carmakers should look to the Andes with sober eyes. "This is a unique opportunity for us," says Bolivian Mining Minister Luis Alberto Echazu. "The days of U.S. car companies buying cheap raw materials to sell expensive cars are over." Indeed, Bolivia's lithium abundance could put car manufacturers in the position of replacing one energy-rich Latin American U.S. critic  Venezuelan President Hugo Chavez  with another. What Bolivia is after is a largely, if not purely, state-run lithium industry from mining to industrialization, which might even include actual manufacturing of the coveted lithium-ion batteries. Morales recently announced a $5.7 million pilot plant to process raw lithium carbonate, now under construction on the edge of the Salar, which hopes to produce its first 40 metric tons of the material by the end of this year. Last week, General Motors Chairman and CEO Rick Wagoner insisted that "the supply, design and construction of [electric-car] batteries must be a core competency of GM." GM plans to build a plant soon, as well as a battery research center, along with the University of Michigan. Toyota is already majority owner of the plant that makes the batteries for its Prius gas-electric hybrid car. Other car companies are looking to manufacturing firms like Chinese BYD, a leading cell-phone battery producer, to satisfy their battery needs. The core question is whether Bolivia's lithi-leverage will eventually drive up the price of those batteries, which can already add about $10,000 to the cost of a car. Experts say that as production of the lithium-ion packs increases, they're actually getting closer in price to cheaper but less effective nickel-based batteries. Still, a big factor will be whether the demand for them rises as much as anticipated. "It is difficult to predict just how many electric vehicles we will see in the market," says Jennifer Moore, a spokeswoman for Ford, which hopes to have its family of BEVs (battery electric vehicles) on the North American market by 2012. "Much depends on the speed at which battery technology progresses, but equally important, cost considerations related to lithium-ion batteries."